Melbourne is a sleepless city with more than 800,000 people moving around the city everyday. This number is estimated to increase to a million people by 2030. Walking accounts for 66% of the trips made in the city. Walking trips are also a major contributor to the economy, being the dominant mode for shopping and tourism. 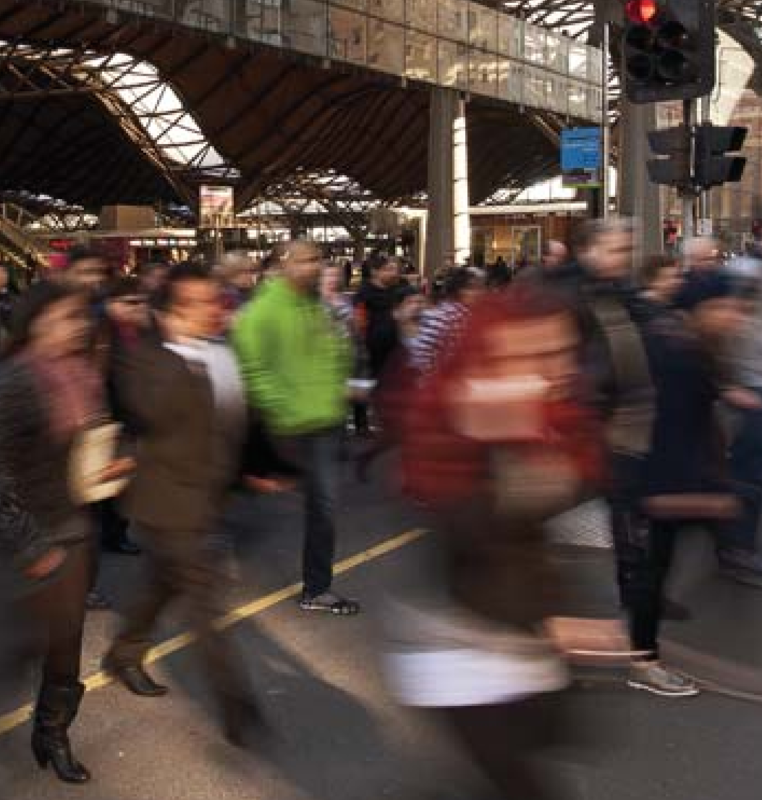 City of Melbourne has recently released a draft walking plan proposing ways to improve walking condition in the city as population grows. In the City of Melbourne, a pedestrian is involved in a fatal or serious injury crash every two days. In 2009-2013, near 1,000 pedestrian crashes were reported in the city which is the highest number of pedestrian crashes in the state of Victoria. Improving the safety and security of the walking environment in the city increases the number of pedestrian activities and therefore contributes more to the economy and well-being of the society. This project aims to analyse and visualise the relationship between number of pedestrian activities and pedestrian safety over time. Our goal is to contribute to the transport strategic plan of the City of Melbourne, specifically the Draft Walking Plan. The project provides further insights into the spatial and temporal distribution of pedestrian activities and crashes and help planners and decision-makers make more informed and data-driven decisions on pedestrian related policies in the city. We used a number of open datasets to deliver this project. We used 5-years worth of pedestrian count data (2009-2013) from City of Melbourne Open Data Portal containing more than 1.1 million rows combined with 5-years worth of pedestrian crash data (2009-2013) extracted from Victorian Government Data Directory. The Best Government Data Hack for demonstrating how govenrment open data can be used to make data-driven and more informed policy decisions. The Best Science Hack for analysing and visualising the relationship between the selected variables namely, number of pedestrian activities and number of pedestrian crashes. Understanding the relationship is critical in modelling and predicting the number of pedestrian crashes. The Best Policy Insight for demonstrating the potential of the analysed relationship being incorporated into transport models to predict the safety outcome of different pedestrian-related policies. Victoria: Planning for our future for addressing challenges related to transport planning and safety. Victoria: Creating Connected Communities for exploring road safety condition in Melbourne using crash stats data and illustrate its link with pedestrian counts. How Do I Get Home Safe at Night?